MAMBAJAO, CAMIGUIN, April 20 (PIA) – To ensure continued harvests, especially among rice farmers, the provincial government here initiated temporary provision of water pumps to needy farmers group. Rice farmer association in Sagay town already availed to the provision and used it to augment their existing irrigation, bringing additional supply from other nearby water sources. The Provincial Agriculture Office (PAO) also advised farmers experiencing irregular irrigation supply to maximize water usage while waiting for the dry season to end. Meanwhile, the community seed banking project in Lakas, Mambajao was able to harvest last month and ready for seed exchange to interested rice farmers. Provincial Agriculturist Renero G. Torion said they also have provisions for the vegetable seed subsidy program, but would only be distributed at the right timing. MAMBAJAO, CAMIGUIN, April 12 (PIA) – More than 7000 farmers in Mambajao from the livestock sector, corn sector, rice sector, including those growing high value crops were subsidized by the Department of Agriculture (DA) and the local government unit (LGU) to boost agricultural productivity and economic activity. As of last year, the government has dispersed ten cattle and conducted the regular bi-annual de-worming, vaccination, and treatment of livestock animals via house-to-house visits. Community seed banking (roll-over scheme) was likewise initiated under the rice program, to include the distribution of laminated sacks and collapsible dryer, while it offers other rice diversification program under the Bottom-up-Budgeting approach. Farm inputs through the Plant Now Pay Later (PNPL) program were turned over to corn farmers, last year, to include seed capital for sweet corn. Under the high value crop development program, the Department of Agriculture is currently distributing plastic drums and cacao seedling, while the Mambajao Municipal Agriculture Office also released seeds and farm inputs for commercial and backyard farming as well as scale-insect control (organic ameliorant) for lanzones trees. Some 1,928 farmer beneficiaries are now enjoying the communal irrigation systems constructed in various areas here to ensure improved production, especially among rice farmers. Starting 2007 to 2015, a total of 270-hectare area was already irrigated with a direct funding of P133 million from the national government, and P15 million counterpart from the local government unit. From the construction and rehabilitation of communal irrigation projects, Mambajao town reported a total of 137 hectares irrigated, 98 hectares in Mahinog, and 35 hectares in Sagay. MAMBAJAO, Camiguin, December 29 (PIA) — Four new farmers, instantly become landowners this year, after the Department of Agrarian Reform (DAR) distributed the Certificates of Land Ownership Award to the Agrarian Reform Beneficiaries (ARBs) in Camiguin province. A total of 5.6 hectares were distributed to three recipients in Mahinog town and 18.3 hectares to one ARB in the municipality of Guinsiliban. According to DAR, these are part of the 23 hectares undistributed Land Acquisition and Distribution (LAD) balances from prior year’s target of DAR, and other years target that necessitates intervention of other implementing agencies like Land Bank of the Philippines (LBP) and Land Registration Authority (LRA). MAMBAJAO, Camiguin, December 29 (PIA) – The Camiguin farmers training center improvement is now underway following the allocation of P1.1 million fund from the Department of Agriculture. Part of the fund was initially released this year to cover for the training center improvement, construction of goat, swine and chicken houses. This will help realize the administration’s aim to become a practical training center in agriculture and provide a good training venue for all its clients in the agricultural sector. The Provincial Agriculture Office (PAO) here also constructed a biocon building to help produce bio-control agents and minimize usage of pesticides against insect pest and diseases. MAMBAJAO, CAMIGUIN, September 22 (PIA) – The improved “camlong” Camiguin-Longkong lanzones variety will be made available to local farms next month through a subsidized scheme, seen to boost quality, production, and economy here. Camlong has a longer shelf life of 12 to 14 days when compared to the native lanzones which changes color four days after harvest. Provincial Governor Jurdin Jesus M. Romualdo called on farmers to maximize on the opportunity and assured them that the process will cut off the production and propagation period of lanzones planting materials to only four months, than the traditional propagation period which requires more than a year, while harvesting is seen as early as five to six years instead of usual eight to twelve years period. Under the plant now pay later program (PNPL), which is also available for other fruit growers, the provincial agriculture office (PAO), will take charge of the land preparation and planting, while the owner secures the area by providing sturdy (not necessarily concrete) perimeter fence to protect the plant from animals and intruders. MAMBAJAO, Camiguin, May 4 (PIA) — Workers in the coconut industry in the province of Camiguin stand to benefit from a new shared service facility (SSF) the Department of Trade and Industry (DTI), Camiguin Provincial Office launched and installed recently. The new service facility includes a diesel engine-powered decorticating machine with winnowing/peat screening machine, a 300-kg digital weighing scale, 70 sets of steel made twining machines and eight sets of hand loom costing around P1,910,000 awarded to the NAGPAKABANA Multi-purpose Cooperative in the municipality of Catarman and Agoho KALIPI Organization in the municipality of Mambajao. The NAGPAKABANA Multi-purpose Cooperative is the eligible cooperator of the SSF while the Agoho Kalipi Organization shared in their resources through a financing grant of the Department of Labor and Employment (DOLE) in cooperation with the Agoho Barangay Council, in providing the production and storage facility of the coconut husk decorticating machine which was then installed, tested and commissioned last April 7, 2015 by Tramat Mercantile, Inc., the supplier of the equipment. The coconut husk decorticator is capable of decorticating 8,000 husks per hour and can also produce coco fibers, coco peat, twined ropes and geo-textiles. These coconut by-products will be marketed in the neighboring provinces to be used in slopes and protect soil erosions. MAMBAJAO, Camiguin, February 5, 2015 (PIA) — Eyeing to encourage farmers to upgrade their local stock, the provincial local government unit (PLGU) here maintains an animal breeding center to showcase good livestock animals as well as extend services to ensure good quality meat produce in the local market. The center also houses an ostrich farm which attracts tourist and students alike, contributing added revenue to the LGU. Last year, the provincial veterinary office (PVO) extended artificial insemination services to small and large animals, benefitting 520 farmers. Meanwhile, under its livestock, poultry protection, and disease prevention the PLGU also regularly offers a year round animal vaccination, treatment, deworming/defluking and castration to local farmers to ensure that the livestock and poultry here are healthy and free from communicable diseases. Some 10,479 animals like cattle, carabao, swine, and goat were vaccinated, 6,576 were treated, 8,839 were also dewormed and defluked, while another 989 heads were also castrated. 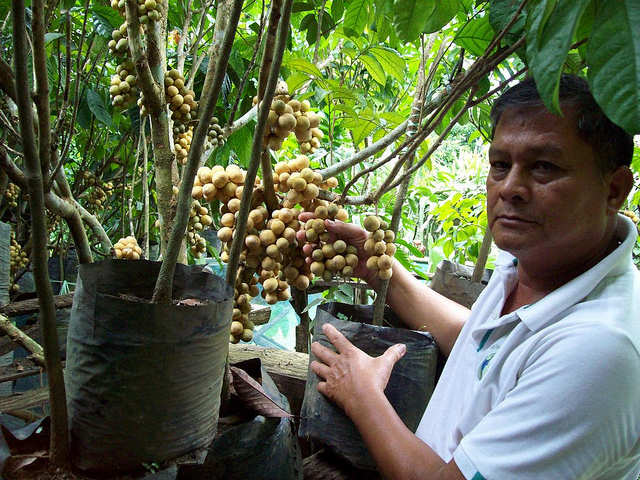 MAMBAJAO, Camiguin, Jan. 20 (PIA) – While it is known to grow the best and sweetest lanzones in the country, the province is likewise eyeing for production increase through macrosomatic cloning. Governor Jesus M. Romualdo bared that the Provincial Agriculture Office (PAO) is now ready for the technology, with a team of trained personnel to handle the macrosomatic training. Romualdo said the process will cut off the production and propgation period of lanzones planting materials to only 4 months, than the traditional propagation period which requires more than a year. 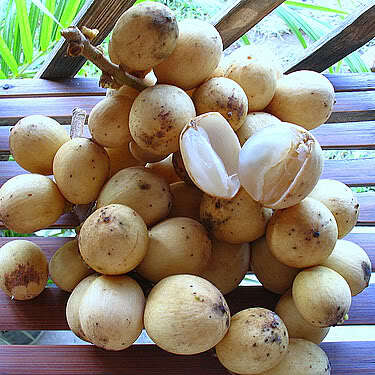 He likewise noted that the province production is increasing every year, along with its new Camlong (Camiguin and Longkong) lanzones variety. For last year, about 20 metric tons of Camlong were produced from the model farm in Mahinog town, with a gross sale of P1.4 million. The Camlong variety is also sold at a higher price because of its shelf life, it can last longer than the native lanzones fruit.